Georgies continues to have your best interests in mind and make every effort to be proactive in providing pertinent information for our customers. Silica exposure in a respirable form is a known cause of cancer. This is why Georgies only sells our glazes in wet form. 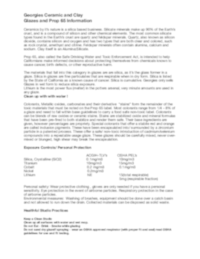 Please click on the photo at left for the 9 page PDF explaining all of the risks and safety precautions for our glazes. Working with clay is rewarding in many different ways. You can make functional ware for your kitchen or decorative pieces for your home. When fired, your work has the potential to last thousands of years, like the pottery of ancient Native American cultures, China and Greece. Unlike the ancients, however, we have more knowledge of the materials we work with. Some ceramic materials can pose definite health risks. These pages are dedicated to bringing you the information you need to safely pursue your art for years to come. The push toward greater knowledge of ceramic material safety began a little over a hundred years ago in response to the appalling numbers of potters poisoned by their work. For example, there were over 400 cases of lead poisoning reported in a single year, 1897, among potters working in a single country (Britain). This trend toward greater safety has continued to the present day, gathering even more momentum over the last ten to twenty years. The first and most obvious step is to eliminate use of toxic materials like lead. Lead has fallen almost completely out of use as a glaze ingredient, and lead-bearing glazes are prohibited from use in most educational, medical or institutional settings. The second step is a bit more complex. The problem we face in working with many ceramic materials may not be the material itself, but its presence in concentrated form. Consider the example of copper. Copper carbonate and copper oxides are often used as glaze pigments. In small quantities, copper is an important component of human body chemistry and crucial to health. When accidentally inhaled or ingested in large quantities, however, copper becomes toxic and may create or contribute to long-term health problems. The question, then, is how to reduce or eliminate the risk of exposure to copper and similar substances in their concentrated forms -- which is how we work with them in ceramics. The first and most important rule in maintaining materials safety in your ceramic studio is to keep it clean and well-organized. Here are a few suggestions. For more information on specific areas of safety concern, click on the menu entries regarding Safety. There is no substitute for your own diligence! Keep dry raw materials in sealable containers. Tupperware and Rubbermaid kitchen canisters work well for this purpose. Label all your containers clearly. Mark which containers (if any) contain hazardous materials. Keep hazardus materials out of childrens' reach. You might consider making your work area off-limits to children, or put locks on cabinets and cupboards. Promptly clean up spills of wet materials before they have a chance to dry and become dust. Cleaning the floor with a wet mop or sponge is much to be preferred over dry sweeping. Sweeping raises and rescatters dust. If you must sweep the floor before mopping, wear a dust mask (minimum) or respirator (preferred) while sweeping. Remember: if you can taste dust, you're also inhaling it. Wear a NIOSH-approved respirator to prevent dust inhalation when measuring, mixing or working with dry raw materials (like clay or glaze ingredients). If you work with molds, wipe them down and scrape extra slip off the sides after each use to minimize dust generation. If you work with molds, store them on metal shelves or shelves lined with contact paper or contact plastic. The abrasive surface of bare wooden shelves will scrape your molds, creating loose plaster dust. 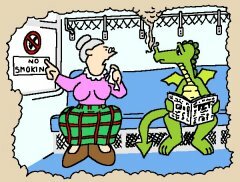 Do not eat, drink or smoke while working in your studio. When you need something to drink, treat that need as an opportunity to take a break from your work. Wash your hands thoroughly after handling clay, glaze or dry materials, before you handle food or drink. When possible, wear "studio clothes" that you don't mind getting dirty while working in your studio. Keep in mind that some ceramic or glaze materials may permanently stain your clothes. Wash your studio clothes separate from the rest of your wardrobe.